Foss (page 1) -- Laurence Foss is an especially interesting Arts & Crafts maker, since he studied with Edward Oakes and is still producing beautiful handmade jewelry. He clearly recalls helping Edward Oakes construct his iconic jeweled silver casket now on prominent display at the Museum of Fine Arts in Boston. 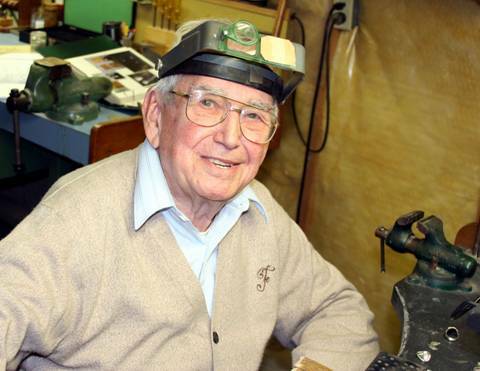 Foss was born in 1920 in Wakefield, Massachusetts, and was educated as an experimental machinist. 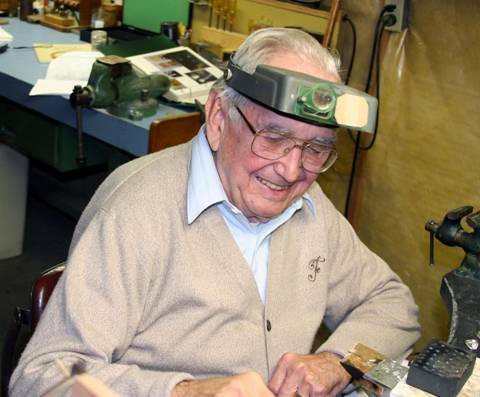 He spent several years at the MIT Radiation Laboratory in the early 1940's, then worked exclusively for Georg Jensen in New York for six years in the late 1940s and early 1950s. The pieces he produced during and after those Jensen years are highly sought after by Arts & Crafts collectors. Foss's mother was Canadian, and his father a bedrock New Englander, a descendent of William Whipple who signed the Declaration of Independence representing New Hampshire. The day before his 15th birthday Laurence Foss made a canon, and as he was ramming in the charge it ignited and blew off part of a finger. Foss says this never hampered his work. Foss was a neighbor of Edward Everett Oakes and a friend of his son Gilbert, and at the age of 10 or 11 would wander into Oakes's studio to watch him work. When schoolmates of the young Foss would ask him to play ball he'd demur, and would instead head for the studio. One day Oakes handed him a saw and said "don't just don't stand there, cut me out some leaves." After that, Oakes taught Foss the basics. Foss also helped Oakes work on projects like the wondrous jeweled casket now in the Boston Museum of Fine Art (which Oakes considered his crowning achievement). In addition to admiring Oakes's technical and artistic prowess, Foss said he had as much respect for Oakes as for his own father. "He didn't drink, he didn't swear, and he gave a lot of lectures at the local church. He'd bring pieces down and show people how these were made. He was just super." According to Foss, Gilbert Oakes was never really interested in jewelry until he left the military service, went to New York, and took a course in gemology. 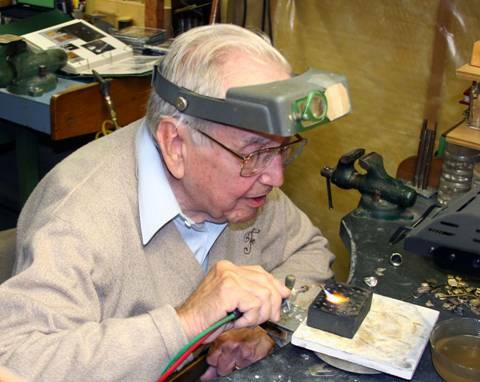 Then Gilbert bought a home and studio in New Hampshire and started making jewelry. After high school Foss went to work for a die maker, where he became expert at silver soldering. This led after a year or so to a job at MIT helping assemble early radar units. After the war MIT transferred him to the bomb lab where he worked on fuses. A colonel there bought a bracelet from him and was so impressed that he told Foss his work should be selling in New York. Foss was flattered but said he didn't like selling. The colonel offered to do all the footwork, and asked Foss to make a gold choker and bracelet which he took to Tiffany in New York on Foss's behalf. The buyers there liked it but said Foss would do better at Georg Jensen, which had arrangements with a few other talented handcrafters. 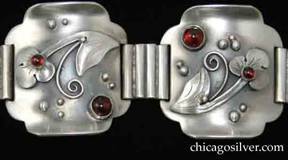 Jensen bought the pieces on the spot, and a few months later offered Foss his own line of silver jewelry. Foss became a mainstay of Georg Jensen's custom design operation, along with Alphonse LaPaglia, Madeleine Turner, Joan Polsdorfer (who signed her work JoPol), and Kurt Eric Christoffersen. He created his well-known L/F mark and began filling orders from a studio in his home, but after five years became tired of producing large quantities of the same few items, and quit to work for another radar development operation. 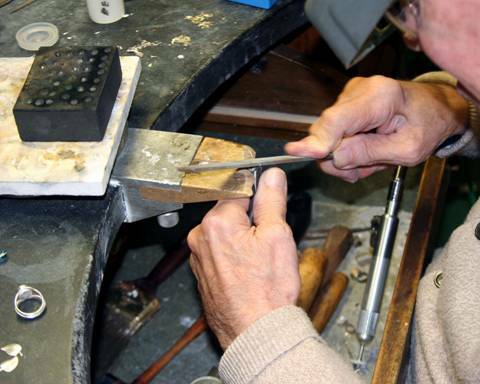 When he retired seven or eight years later he began producing jewelry full-time, focusing on entirely handmade pieces rather than hand-assembled production work. 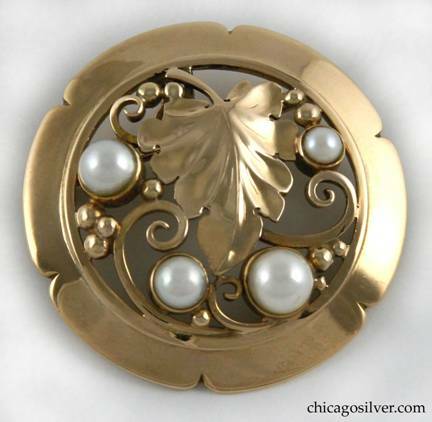 Oakes once learned that Foss was using machine-made silver for his detail work and blanched. "Oakes created all his own," Foss said. "He'd take a piece of wire, and put it in a block with a V in it. He'd hammer that wire down in the block and work it over and over then pull it through draw plates and make his own tubing. When he found out I was buying it, he had a fit, saying 'that's not fair!'" To some, the Arts & Crafts movement is a charming slice of history bringing together populist craft, women's emancipation, the end of fussy Victorianism, and an early form of rage against the machine. To others it is a century-old aesthetic revolution providing the first stirrings of modernism. And to many it is simply a catch-phrase for a timeless class of handmade wood, ceramic, and metal antiques. The firebrands who created the movement are long gone. But to master craftsman Laurence Foss, it is not just a dusty historical record, but a long unbroken living thread that stretches from him directly to back to the early Arts & Crafts founders. Foss learned his craft by working with Oakes. 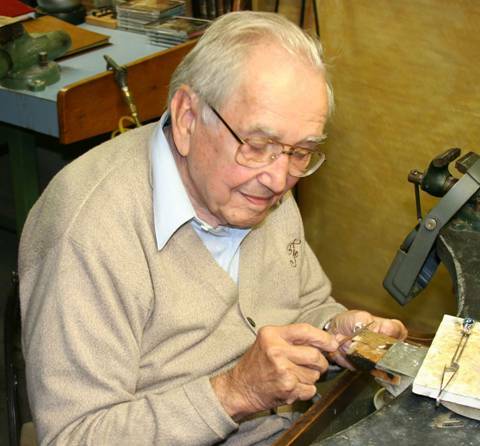 Oakes was a student of Frank Gardner Hale, who was regarded as one of the very best jewelers in America. And Hale studied with Charles Robert Ashbee, the grand old man of the Arts & Crafts movement who founded the British Guild of Handicraft in 1888 and was a revered metalsmith in his own right. Handwrought metalwork by Ashby, Hale, and Oakes is prized by museums and collectors. Objects by Foss are less well known, but are still snapped up eagerly by devotees. Some of Foss's fine work is very much like that of Oakes, while other pieces clearly show the Jensen influence. He is a living national treasure. 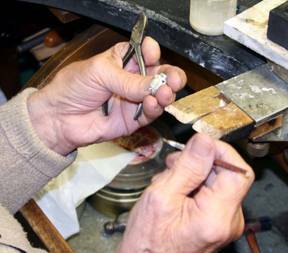 Foss's jewelry has been sold in Arts and Crafts stores in New England, and at Boston's Shreve, Crump and Lowe, but most sales have been private. Foss's work at times is reminiscent of Oakes, with bead and curving wirework decorations, delicate applied ornament, and striking use of small bezel-set cabochon semiprecious stones. The surfaces often have a velvety finish, and a distinctive use of oxidization. Other pieces can be somewhat Jensenesque, with applied stylized details taken from nature. The two bracelets above by Gilbert Oakes and Laurence Foss share many common elements, with interspersed onyx links and the use of pearls, serrated leaves, beads and curving wirework. 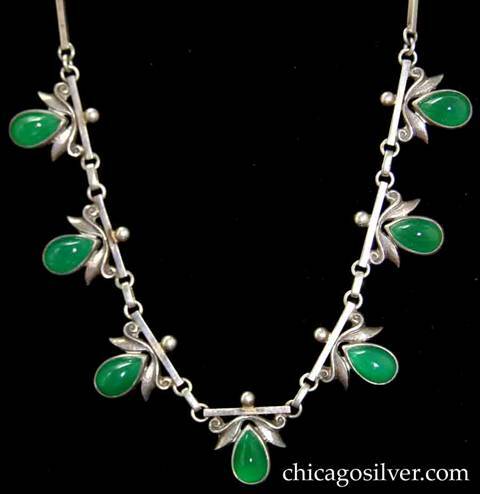 Necklace composed of ten bar links and seven links with teardrop-shaped green bezel-set cabochon stones below scrolling ornament with stylized leaves, and small bead at very top. Links with stones and intermediate links are bar-shaped and joined to each other with small round silver loops. This piece was made while Foss was working at Georg Jensen. 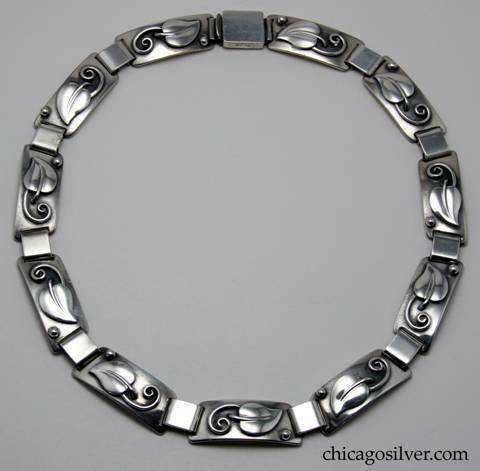 Necklace / choker, composed of eleven graduated trapezoidal links, each with an applied leaf with curving stem and separate bead, joined to the others by thick silver loops. Spring clasp. 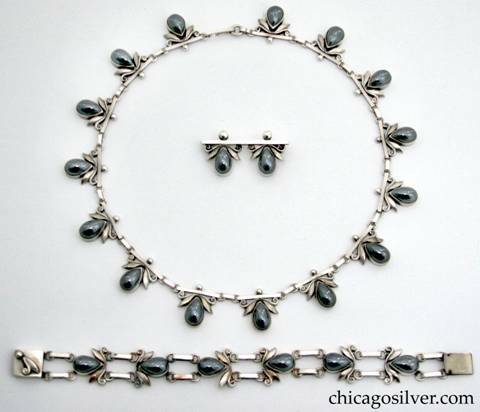 Set consisting of necklace, link bracelet, and pin, all with bezel-set teardrop cabochon hematite stones each with a stylized silver leaf and scroll at the point of the teardrop. Leaf details above the stones are hand-worked. All pieces are heavy. 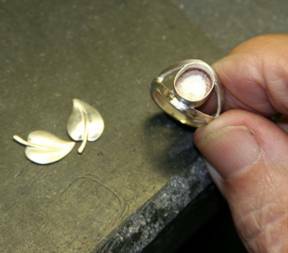 This piece was made while Foss was working at Georg Jensen. Necklace, with unusual chain, composed of six links with a pointed leaf atop a curving stem. The chain is attached to a spiraling wire with a silver bead that projects from the curved end and is made of 12 long silver bars, each connected with three silver rings. Bracelet, with carnelians. Four large square convex links alternating with four smaller oval flat ones. The large links have curved corners, and tops and bottoms that curve upward, with a large applied oak leaf, a small round cabochon bezel-set carnelian stone, and bead and curving wirework detail on each. The small links have large oval bezel-set cabochon carnelian stones on each, with notched bezels and a thin beaded wire ornament surrounding the bezel. Links are joined with wide silver tubes. The piece has many Oakes-type details. Heavy. Bracelet, large, with garnets. Three square open links alternating with three oval-sided ones, each slightly convex and with a large round bezel-set deep red cabochon garnet in one corner. Surrounding the stones are stylized blossoms, leaves, beads, and open wirework scrolls. While all Foss bracelets are handsome, this one is especially lovely, and is very much like the work of Oakes. Bracelet, with carnelians. 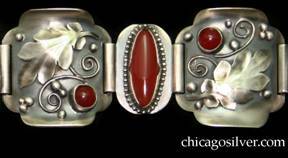 Six square slightly convex open links, each with a flower blossom, silver beads, wirework scrolls, and a square bezel-set deep red cabochon carnelian stone in one corner. Additional applied flower blossom on a separate clasp. While all Foss bracelets are handsome, this one is also especially lovely, and is very much like the work of Oakes. Bracelet, with pearls. Three rectangular convex open links each with leaves, silver beads, wirework scrolls, and a large round bezel-set pearl, alternating with three narrow rectangular bezel-set onyx links. Additional applied beads and wirework scroll on a separate clasp. Very much like the work of Oakes. Bracelet, link, with carnelians and nine alternating links plus clasp. Five larger links are rectangular with a stylized tulip and applied beads and curving wirework, and four are smaller rectangular ones with a bezel set cabochon carnelian stone in each alternating link. Bracelet, link, with garnets. Five large rectangular convex links lobed links with upturned edges at top and bottom and applied flowers that have beaded and curving wire ornament, and a small bezel-set cabochon garnet at the center of each blossom, surrounded by additional beaded ornament and a larger round bezel-set cabochon garnet. Hinges connecting the links are made of four joined silver tubes. Heavy. Bracelet, link, with rhodochrosites and eight alternating links. Four larger ones are rectangular with a leaf, applied beads and curving wirework in a central oval with an oxidized background, and four smaller ones are rectangular with a bezel set pink cabochon rhodochrosite stone in each alternating link and on the clasp. Heavy. Bracelet, link, with turquoises. Four large rectangular convex links alternating with four smaller ones. The large links have applied stylized Jensen-type doves with beaded and curving wire ornament, inside an oxidized oval recessed frame. The small links have oval bezel-set cabochon turquoise stones and clipped corners. Bracelet, link, with garnets. Four large rectangular convex links alternating with four smaller ones. The large links have applied flowers with beaded and curving wire ornament, and a small bezel-set cabochon garnet at the center of each blossom. The small links have applied beaded and curving wire ornament, and a small bezel-set cabochon garnet inside one of the curving wire loops. Bracelet, with seven alternating links of four round bezel-set cabochon turquoise stones on stepped small round silver frames, alternating with three smaller round links each with silver dome surrounded by ring of small beads. Links are joined by single wide loops. Clasp has chased disk that fits through T-shaped slot inside ring. Bracelet, link, sterling with copper. Five convex rectangular links each centering a recessed freeform copper shape, interspersed with four smaller square plain rectangular links. Box clasp. Unusual use of copper and sterling for this maker. Bracelet, link, with carnelians or red agates. Four large rectangular convex links alternating with four smaller ones. The large links have applied leaves with beaded and curving wire ornament. The small links have square bezel-set cabochon stones. While most Foss jewelry has a soft "brushed" surface, this bracelet is highly polished.